The Palestinian political prisoners suffered 22 days of hunger as they decided to fight with their empty stomachs the oppression and the injustice of the Israeli Occupation. 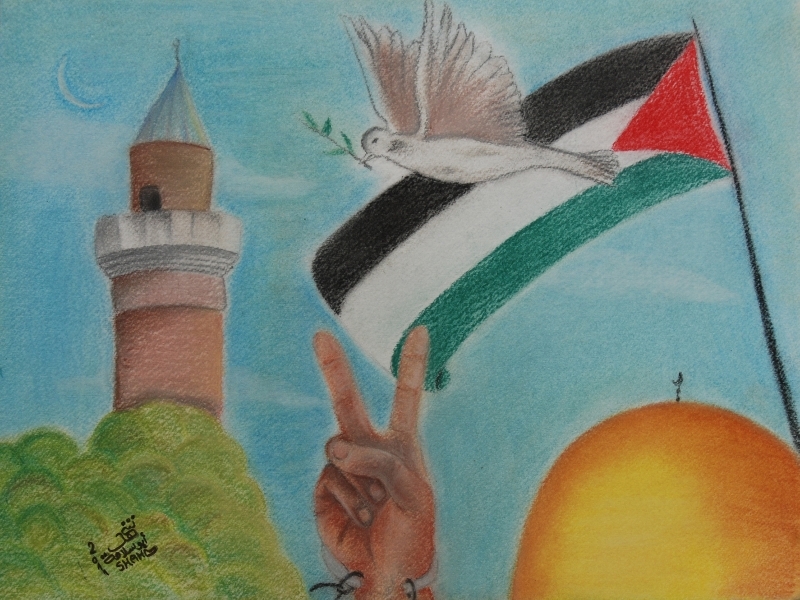 They eventually decide to no longer go on with their battle against the violation of their rights as the Israeli Prison Service promised to meet their list of demands which had on the top “ending the solitary confinement policy”. However, that wasn’t but another cruel trick for them to break the hunger strike. As usual, they’ve never stuck to something they said and their hypocrisy has been one of their traits which characterize them the most. Israel keeps on breaking all the International treaties including Geneva Convention which guaranteed the right of Palestinian prisoners to be treated as War prisoners, and instead, they describe them as “terrorists”. A friend of mine who had the sit-in tent as a shelter during the hunger strike of our prisoners and who himself joined the hunger strike in solidarity texted me that Ahmad Saadat, the PFLP secretary-general, is bound to serve one mor e full year of pain in isolation. They have ignored the worrying health condition of Saadat as a result of the carelessness of medical care along with his solitary confinement which started since March 16, 2009. Saadat was not allowed any visitations and even denied his right to write or receive letters from his family during his solitary confinement. 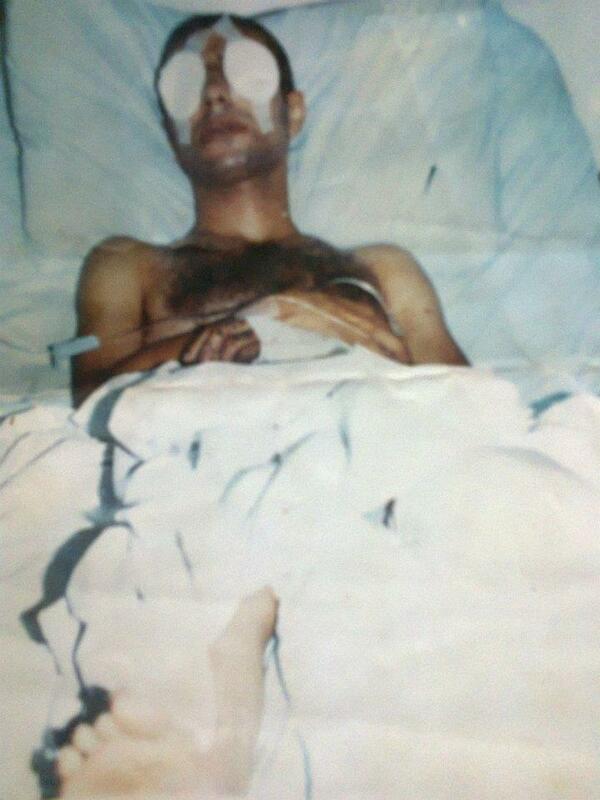 Saadat was sent to court ignoring his lawyer, who never received a notice regarding this court session. 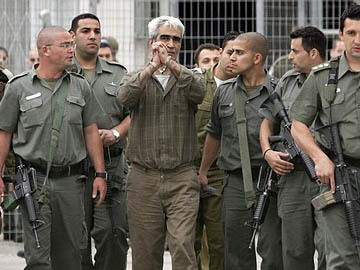 The Ad-Dameer, one of the human rights organizations, stated that by sentencing Saadat to solitary confinement for an additional year, the court violated promises by the Israeli Prison Administration to receive treatment that is guaranteed by the International law. No justification for this criminal and illegal decision has been provided. “It would be difficult for a prisoner in a normal jail to pass through his imprisonment without suffering psychological problems or at least depression, so imagine how difficult it would be for a prisoner in the solitary confinement for long time.” Loai continued. No wonder that is true; the mankind is a sociable creature, and if one is totally isolated from the outer world in a very narrow cell in which light could barely sneak, psychological and mental problems are hardly avoidable. The brutality of the Israeli entity can never be imagined by someone who has never experienced their inhumane behavior. As Ahmad Saadat’s case occupied my thoughts, I remembered what my father told me about the psychological methods of torment which he endured during his imprisonment and which Israel continue to exercise daily over all the Palestinian prisoners inside the Israeli jails which never follow any of human virtues or the International Humanitarian Law. The more I think about this, the more I fear about Ahmad Saadat’s mental and physical health. Trying to be positive, I recalled when my father told me “Ahmad Saadat is one of the toughest men I’ve ever know in my life.” It’s true, but that doesn’t mean that Israel should continue breaking its obligations to end its solitary confinement policies, and to implement the demands of the detainees after they conducted a hunger-strike for 22 days. It’s time to take action to fight injustice and to guarantee human rights for all people. Mohammad Barash is a disabled political prisoner inside Nafha Prison; one of 85 prisoners who are either physically or mentally disabled. On the 17th of February, 2003, he was arrested after he was badly injured, and despite his disability, which resulted from his injuries, he was given three life sentences plus 35 years. He is still continuing his struggle with pride inside a cell paying a double price; his precious years of prime and the consequences of zionist entity’s crimes. ‘Don’t tell my mother that I can no longer see. She can see me but I can’t see. I fake my smiles when she shows me the photographs of my siblings, friends, and neighbors as she doesn’t know, that I have become blind after illness spread in my eyes till the darkness filled me. Don’t tell her that I waited for several years to have a surgery to plant a cornea. But the Israeli Prison Service kept on procrastinating and procrastinating providing my eyes all reasons to leave me. Don’t tell my mother that the shrapnel of bullets and the bombs which managed to hit me is still settling in my body, and that my left leg had been mutilated and replaced by a plastic one. Don’t tell her that the other leg rotted and dried of blood and life. Don’t tell my mother that the prisoner’s emotions got stripped of the most basic elements of human life as he is sentenced to see only ashes and iron, lightless life and hopelessness. Tell her that I am alive and safe. Tell her that I can see, walk, run, play, jump, write and read. 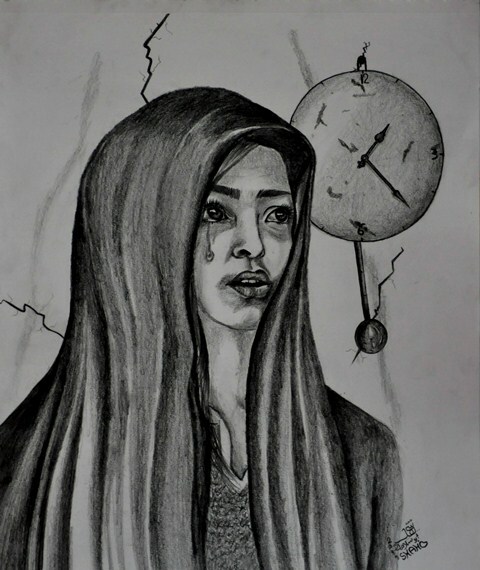 Don’t tell her that I am shouldering my pains on my walking stick, and I can picture every martyr as a moon souring in the sky and calling me with the power of lightning, thunder and clouds. Don’t tell her that I suffer from sleepless nights, and that I live under the mercy of the pain killers till it drugs my body. Don’t tell her that I keep twiddling my stuff till I barge into the iron beds or another prisoner sleeping close to me, to wake him up to help me reach the bathroom. Don’t tell her that wakefulness always hurts me and sleep never visits me. Don’t tell her that a piece of lead entered my eye in that bloody day in the camp streets. They aggressively shot me until my leg was cut off, and my eye was gone. And before I fainted I saw a little kid running toward me waving the Palestinian flag while screaming: a martyr, a martyr. Tell her that my dream is not enough. My nostalgia for her is too much and her soul never leaves me. I still have from her my language, my purity, my symbols stuck on the wall, all of which heal my pain every time the light disappears around me. Tell her that I always embrace her holy prayers, to survive from the dark cloud that surrounds me after my body has tortured me. I might get back to her or I might not, but I left the answer to this question open, although I’ve chosen spiritually to be close to her heart, as if I chose my future, of which I have officially no control. 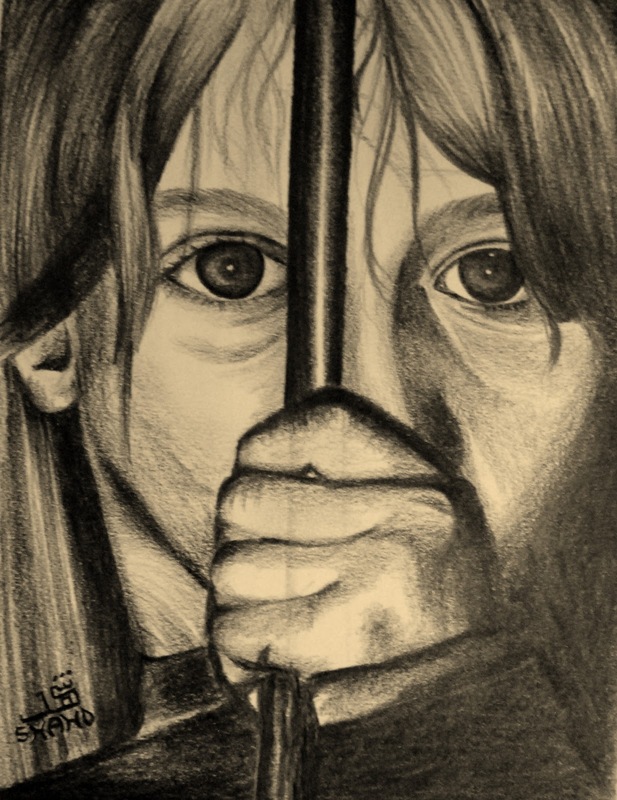 Don’t tell her that Israel, a country in the 21st century, has turned the prisons into places where diseases are planted and bodies are ruined slowly; and slowly, it turned to be fields of trial for living people whose death is inevitable sooner or later. Don’t tell her that I have become knowledgeable of all names of horrible illnesses and strange medications, along with all types of pain killers, while I’m witnessing my friend Zakariyya diving into a coma, with an ending unknown to me. Don’t tell my mother about the sick prisoners whose diseases launched an insane war against their bodies: Ahmad Abu Errab, Khaled Ashawish, Ahmad El-Najjar, Mansour Mowqeda, Akram Mansour, Ahmad Samara, Wafaa El-Bis, Reema Daraghma, Tareq Asi, Mo’tasim Radad, Riyad Al-Amour, Yasir Nazzal, Ashraf Abu-Thare’, Jihad Abu-Haniyy. The merciless Israeli prisons slaughter them; illness and carelessness of a country that enjoys slow death sentences and funerals for others. This was Mohammad’s letter to his mother which unveils the inhumane nature of Israel which claims to be the only democracy in the Middle East while violating the most fundamental human values. I meant to share with you those powerful words he wrote in Arabic to help you picture the torturous conditions that the prisoners endure inside the Israeli cells, especially the disabled. The core of their shameful crimes which offend any sense of propriety in any heart with any shred of conscience, were done under the banner of maintaining security. However, in this case where those disabled prisoners can hardly threaten their holy safety, how would they justify this? The prisoners’ families make sure not to miss any day of the weekly protests, so the number of the people inside the Red Cross building is more than usual on Mondays. Therefore, one should expect to see lots of tears and hear lots of tragedies, especially after the names of the soon-to-be released prisoners were declared. As I entered the Red Cross on Monday last week, an old woman was sitting in a corner, hardly noticeable. She was putting her hand on her cheeks, closing her eyes and saying nothing. The wrinkles on her face, with expressions of sorrow and burdens and the broken glass frame of the picture she was holding, directed my steps toward her. I tried to talk to her but I didn’t get an immediate answer. She responded only after I started talking very loudly while holding her hands. I realized that she can barely hear anything and her vision is very weak. “Who’s this man in the picture?” I asked loudly. Umm Fares Baroud at the Red Cross sit-in tent in solidarity with Palestinian political prisoners. “This is my son Fares, my darling. He’s not going to be released. I am very sick and about to die. I even spent last night in hospital. Why wasn’t he included to fill my last days of my life which passed for 20 long years without him? I want to enjoy hugging my son before I die,” she said with tears falling so intensively and bitterly. Calming her was a very difficult task, but one can imagine how deeply her wounds were felt. I was looking around asking who accompanied that lady to the tent, as I found it impossible to imagine that a blind woman came by herself. However, what I thought was impossible, was actually a fact. After questioning people in the Red Cross about her, I met a young woman who seemed to know her. She told me that the old woman, Umm Fares, lives alone in Beach Camp. Her husband passed away years ago and she has nobody to take care of her. It was very hard for me to believe that this very old woman, who can barely walk, see or hear, lives alone. I was very angry and questioned aloud how an old sick woman could be left alone with no one to look after her. But the young woman calmed me down after she declared that Umm Fares was a reason for her to keep coming to the weekly protests. She even arranged a group of girls to help her and show solidarity with her. They have taken turns during the week to visit her as much as they could. Hearing that, I couldn’t help but smiling with relief to know that there are still some caring people, and without her asking me to join her group, I stated that I am already a part of them. The young woman told me that she once was sitting with Umm Fares in her very simple and narrow house, chatting, attempting to make her feel that she was not alone or forgotten. Suddenly Umm Fares asked her to bring a piece of paper and a pen to write down what she heard her say. “Dear Fares, when you are free, I’m going to pick for you the most beautiful bride in Palestine. I’m going to build a big house for you to live in with your kids. Stay steadfast my darling and God willing your freedom will be soon,” she said while her weak hands dried the tears that fell on her cheeks. The poor woman didn’t realize that she was only a dreamer, but a dreamer who never gives up. No one has left a profound impact on me as much as this woman, Umm Fares. I pray that she gets the chance to see her son before she dies and I promise her that she will never be alone. 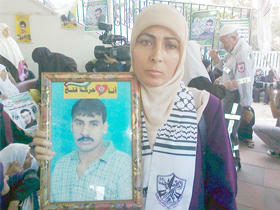 There are many people who will never forget her or her precious tears over her son’s ongoing imprisonment. I had a one-hour break at university on Saturday, so I grabbed the chance to visit the Palestinian detainees’ solidarity tent by the Red Crossbuilding. Every day I go, I see the same people, whom I’ve started to feel are a part of me. When one of them is not there, I miss them, as I recently have spent more time with them than my family.As I arrived at the tent, I felt that there was something strange going on. I asked a friend what had happened earlier. She answered while pointing, “That woman, Najiyya, just fainted when she learned that her husband is not included in the swap deal.” I kept sympathetically following her with my eyes wherever she went. She lifted my spirits up as she walked toward me and sat in an empty chair next to me. She smiled at me, despite her sorrow. I wish she knew how much people like her give me indescribable spiritual power with their incredible strength and steadfastness. Seeing her smile again, while knowing that she was broken inside, brought life to me. I couldn’t help but smile back with a look of admiration and appreciation. “I waited long enough for him to come back to me; 19 years of forced separation between us. I’ve always fantasized about our unborn child, as the imprisonment of my husband after less than one year of our marriage prevented me from ever having one,” she said after I asked her whether she feels better. “They broke into our house in October of 1993 and kidnapped him very late at night from inside our home in an excessively violent way,” she continued while tears struggled to fall from her eyes. She looked in a different direction and fell in silence trying to hide that feminine character inside her. I learned that her husband Salama Mesleh was sentenced for 99 years inside the Israeli prisons. I was amazed at her ability to stay strong and optimistic for a day that would come when she would be united with her husband in a warm house full of love and harmony and bring up their first child. My sympathy got even deeper for her as I learned that she had been very close to delivering a child. She was 2 months pregnant when the Israeli army attacked her house and turned everything upside down and kidnapped her husband. Her experience was too much to tolerate. The Israeli army didn’t only take her husband away but also killed the fetus growing inside her. If she didn’t go through all these horrific circumstances, maybe this fetus would have turned out to be an 18-year-old man by now who would take care of her while she bravely fights her harsh destiny. I suddenly realized that I ran out of time and it was the time to go back to my lecture at university. I had to go there only for the attendance check and be in the class only in body but I knew that my mind would stay with the prisoners and their families. I couldn’t wait till the lecture ended to return to the Red Cross. I thought that I would go back and see the usual sight of people sitting in the tent chatting while songs for freedom for our detainees are playing. But that wasn’t the case. There was an emergency taking place; people were running inside the Red Cross. An ambulance’s siren was very loud and its red lights were flashing all over the place. My heart skipped a beat as I realized I had missed something during the hour I was at university. My fear of the unknown overcame me. I was trying to pass through the crowd to discover that the same woman, Najiyya, lost consciousness again. She couldn’t bear the psychological conflict she had inside her — not knowing whether her husband was going to be released or not. At first, she heard that her spouse was included; and then discovered that he was not. She was swinging between facts and illusions to realize later the fact that her husband will stay jailed inside the dark cells. I learned that she was walking around while talking to herself unconsciously and she suddenly stopped and looked at a big banner that includes the picture of her husband, and then fell down. I know no matter how strong and how much of a fighter she is, she is a human at the end of the day. The fact that her husband is not going to be free was very hard for her to accept, especially since she was lingering with the hope which the swap deal had brought her. Press here to read this article in French. Press here to read it on Electronic Intifada.